News and updates about our club. Unfortunately we have to cancel our New Years Eve Dance. A full refund will be available on Dec. 10th and 17th at the dance club for the New Year’s dance. Sunday, Nov 25 – Jeff Priest will be calling and entertaining the dancers to an afternoon of full mainstream dancing. 2-4:30pm. $5pp. Emmanuel United Church hall, 534 George Street North, Peterborough. For info email or phone 705 875 7793. Don’t miss this opportunity to dance to Jeff – great caller and singer! October 29 will be a Halloween party and dancing. Costumes are optional; some members are not comfortable dressing up so please do not miss dancing because you do not want to wear a costume. Usually about half of the dancers dress up. For those who are wearing costumes, we will have a parade and a couple of people not wearing costume will decide who deserves a prize for the best woman’s, man’s and couples costume. Some mainstream tips will be mixed in with basic dancing. This is a free night, everyone is invited to stay until 9pm. On November 12 we will be offering used square dance clothing for sale. The clothes are donated to us by people who have no more use of them; the proceeds of this sale will be given to a local charity. 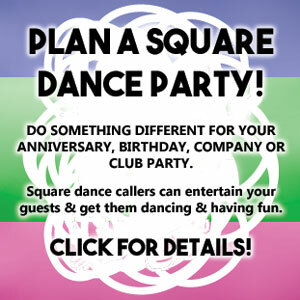 I was recently asked why our club does not “allow” people to wear square dance clothing on club nights. This is not the case – although our club has a “casual dress” policy, anyone wishing to wear square dance attire every Monday night is free to do this. We make this clothing available for those who wish to wear square dance attire especially when attending special outside dances and events. (Like our own special Frosty Fling dance – Jan 27 2019). Keep the questions coming so we can be sure to respond to any concerns you may have! Some of you may not know caller Grant Logan, who passed away on Thursday. He called for our Sunday mainstream dance this year on April 8th. A Celebration of his Life will be held at the Jerrett Life Celebration Centre, 8088 Yonge St, Thornhill (south of Hwy 7) on Tuesday, October 23, 2018 from 12pm-2pm. Please note that there will be no dancing on Monday, October 8. We will resume regular dancing on Monday, Oct 15. If you did not sign up for a club name badge, let us know ASAP. If we have to place an order for less than 6 badges they cost more; order yours now for the lower price! WHAT: Come and meet our friendly dancers – visit our booth! Club members must fill out a registration form. Please fill it in and bring it back with the $5 fee which includes $1 for membership and $4 is for insurance. If you do not have a printer there will be hard copies of the registration form available at the club. Our Social Conveners, Heather and Glenda will have a sign up sheet for help with refreshments. Please step up and help. It is not a big job if it is spread out over many people. Heather and Glenda are responsible to make sure the supplies are there but it is not their job to make the refreshments every week and clean up. Please consider bringing you own mug so we can cut down on waste. If you need a club name badge, we will be taking orders at the treasurer’s table. A badge with a magnet costs $10 or $8 with a pin and must be pre-paid. Anyone ordering their first ever badge gets a free dance the night you pick up your badge. Last date for orders is Monday, Oct 1st. A Calendar for the year has been posted. Hard copies will be available at the club. Our presidents this year are Charles Paterson and Doris Buttar. They are always available to speak with anyone if you have any concerns or suggestions.